I am not romantic about cold calling. Nor am I romantic about social selling, even though I probably use the tools as well as most. There are different mediums one can use to create new opportunities, and it doesn’t make sense to eliminate one medium simply because another medium is available. There is simply nothing about any medium that makes it an exclusive choice. Like a toolbox, you use different tools for different purposes. There are people, however, who are romantic about “social selling,” and they believe that older mediums—like the telephone—are no longer valuable. Mostly, these folks sell “social selling.” They have set up cold calling, something salespeople don’t like, as a straw man to have something to rail against to gain clients. My friends at Sales for Life published this post as evidence that cold calling was facing its demise. This is a rebuttal. Cold Calling has a poor conversion rate. The article uses Keller Research Center’s research to show that conversion rate at 1 percent. That research was based on real estate agents, not B2B sales professionals. Your conversion rate is your own. Your cold calling may not work, but my cold calling works just fine. Only 28 percent of those cold calls engaged in conversations. Same research, but be that as it may, if I could speak to 3 out of every 10 people I connected with, that would be more than enough. But again, you need to skills to engage people in conversation. Forrester says 37 percent of order takers and 27 percent of explainer archetypes will be displaced. Why do people hate cold calling? Because they are conflict averse. Guess what makes you are order-taker or an explainer? Being conflict averse. But so does hiding behind social platforms and using email. Salespeople are becoming obsolete, with 1,000,000 sellers losing their job to self service e-commerce. There is zero doubt this is true, but Twitter isn’t going to save you. Neither is LinkedIn. Only business acumen and deep chops can help you. You are either a trusted advisor, or you are something less than that. B2B e-commerce will top 1.1 trillion dollars and account for 12.1 percent of all B2B sales. That number will grow. It is irrelevant to any argument about cold calling, and that number will grow regardless of whether or not you passively wait for opportunities to come to you. I would argue that aggressively pursuing a seat at the table is better advice. There are more people involved in buying decisions, requiring a team selling approach. This has nothing whatsoever to do with cold calling. In regard to an argument about cold calling, it should be ignored. Nine out of ten top-level decision-makers don’t respond to cold outreach. Again, if you have nothing worth their time, this is true. But that speaks only to your chops, and says nothing about the medium. You are free to believe what you want, but when your competitor fearlessly picks up the phone and has something to say, believing this will hurt you. You are better improving the value you create. That said, every day people use the phone and schedule appointments with decision-makers. This “statistic” is suspect at best. 75 percent of B2B leaders say that they regularly use social media in their decision-making process. What’s interesting here is that the people who would recommend you use the telephone would recommend you all use every other channel. This statistic is suspect, and says nothing about how social is being used. Salesforce reports that 74 percent of buyers choose a salesperson who is first to add value and insight. But how do you cut through the clutter on social? How do you engage in real life conversations where you can share your insights? What’s the fastest way to get in front of a client and share your insight? Still, nothing about cold calling. 20 percent of salespeople add value to the process and have five times greater engagement with buyers. Well, that make sense. There is a top 20 percent for a reason, is there not? 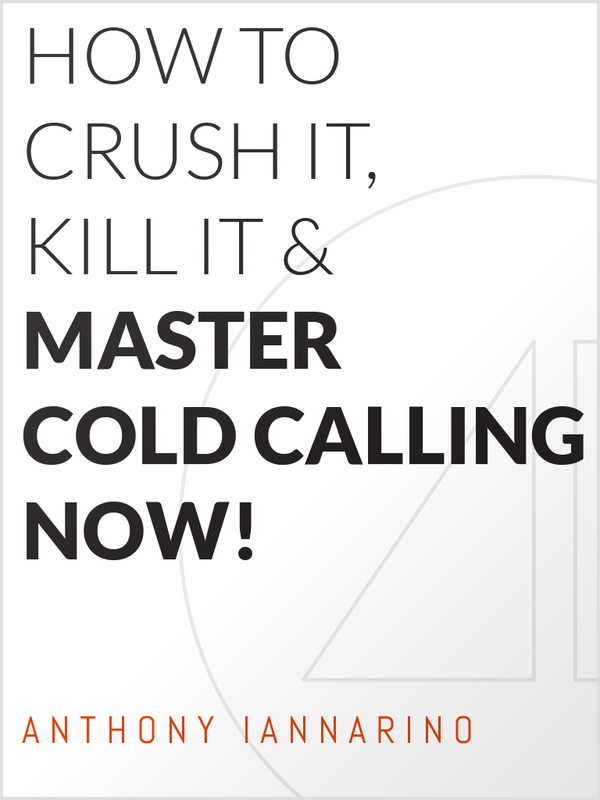 What does it say about cold calling? 84 percent of B2B leaders start their buying journey with referrals and cold calling cannot reach the vast majority of B2B decision makers. Seriously? The same folks that fear the phone are even more timid when it comes to asking for referrals. So much passivity, so much waiting. Are you going to live forever? Does speed to results count for anything? This “data point” is more than suspect. If this were true, your pipeline would be made up of 84 percent referrals, and it something less than that–and closer to 0 percent. Forrester says 70 of execs say salespeople are unprepared to answer their questions, and “there is no way a salesperson on a cold call can be as prepared as a social seller.” What? So as soon as I dial, my business acumen dissipates? I’ve somehow lost my experience and situational knowledge? This makes no sense, and as such, should be ignored. Salespeople need case studies that they don’t have. I am stumped. I really am. There is some correlation between cold calls and case studies? 90 percent of marketing professionals say you need an account-based marketing approach. Targeting? Multiple stakeholders? Messaging? Bell bottoms. This is nothing new. It’s fashion. The average salesperson makes only two attempts to reach a prospect. “Success in social requires many touch points through a variety of channels.” That isn’t success in social, it’s success in prospecting and developing relationships. One of those touches should be the phone. Another should be face-to-face. Use social, too. This statistics adds nothing to the case that cold calling is seeing its demise. Be careful what you believe. You are entitled to believe whatever you want, but you are not free from the consequences.